In the new book "Leading Out Retail" (March, 2014), Donny Perry offers an energetic and creative take on the world of bike shops, their continuing efforts to survive, and their prospects for the future. Perry has a decade of bicycle retail experience and is now global development manager of Specialized Bicycles Components University (SBCU). He is also known on the Internet as the guy who has proposed better pay for bicycle technicians. Perry believes the future belongs to "a different kind of retailer with a different mindset." Much of his book is aimed at describing that difference, and offering strategies for positive change. Perry opens with an analysis of a bike shop universe in decline. He points out that the number of stores has fallen from 6,195 in 2000 to 4,055 in 2013. He writes that in the future, "the drop in the number of bike retailers is not going to be linear, it will be exponential." He suggests a 35 percent loss in storefronts in 15 years, and then adds "I believe the change will be faster." Perry says retailers will be hit from three sides: Internet competition, consumer-direct sales by manufacturers, and bikes that are simpler to assemble, use and maintain. The result will be less consumer dependence on bike shops, leading to fewer shops in the population. The survivors will do much more than just supply goods. They will focus on connections and community rather than just buying stuff, marking it up to a sustainable margin, and selling it. "Those who survive the next decade will live through the most dynamic and lasting change the world of retail will ever see," Perry writes. "This book was written as a roadmap for the local bike shop during this time of disruption. My aim is to provide simple, tactical processes for improving business and preparing for the next era of retail." The goals: "faster transactions, higher average sales and most importantly how to create greater engagement with customers . My hope is that retailers will read the book, pick the ideas that are best for their business, and then go after them with complete aggression to see them through." Some of the advice is described as "counterintuitive," and some specifics may cause some mild shock and wrinkled brows from those accustomed to more traditional approaches, but Perry offers insightful information here. He suggests an intentional approach to retailing that is based at least in part on real-world best practices from successful bicycle retailers. Take service as an example. Perry sees the service department as a huge advantage for brick-and-mortar retailers. Service will need to evolve though, Perry suggests, and retailers that want to survive should work now to dominate service in their markets. Service will be the most important factor in survival or destruction for many stores. He suggests strategies for taking service dollars from the competition, differentiating services (zig when the other guy zags), and selling new types of services. Salespeople are re-branded here as "leadouts," indicating a firm rejection of pushy, aggressive, manipulative and fake sales connivers. Re-branding as leadouts is an affirmation of leading out in the customer's best interest, "to give their energy and guidance in helping every customer achieve their goal." The successful retail business of the future will have a great looking store, a focus on continuous improvement, and on going efforts to create community and "lasting engagement" with customers, Perry believes. "The IBR (Independent Bicycle Retailer) never needs to cut corners or slice prices, their customers recognize their work and see value in everything they do. The IBR may not be cheaper, but they are different, they are better, and customers see themselves as partners," Perry writes. Making this difference relies on having excellent staff, and Perry devotes a lot of time to this. He describes the common retail store employee as "Timmy," someone who doesn't understand a lot of things, and is the "lowest common denominator in the bike retail business." Success depends on making your Timmies great. Hiring, training and managing well and on purpose are the keys to good Timmy performance. Perry suggests creating training plans, processes and procedures that employees can understand and that allow them to be successful. Systems make it possible that you not only develop great Timmys today, but great Timmys tomorrow. One of the book's promised counter-intuitive moments is advice that the best approach on the sales floor is not the typical Sales 1A use of open-ended questions. Perry believes that this is "an outdated approach that will only backfire on the majority who try to use it." He describes it as a "lame attempt to break the ice by creating meaningless small talk." "For many customers, this type of conversation is not seen as a service but rather an enormous waste of time . retailers do not build friendships first, instead they build respect and trust. And they do that through offering a great product or service while respecting a customer's intelligence and time. The faster the person working takes the conversation to business, the more respectful they're being with the customer and their time," Perry writes. A better way to approach customers is one that traditional sales trainers have criticized for a long time: "Can I help you today?" Perry finds this question more authentic than other options, and doesn't fear the "No thanks, I"m just looking" auto-response. Instead, it works "because many customers simply prefer a quiet moment to roam the store, get their bearings, and do a bit of research without interruption ... the goal of the invitation is not to get them to engage, the goal is to make them aware that someone is available to help." Perry's book offers a lot more than philosophy. It includes details, including a look at budgeting, marketing and pricing. He discusses bundling and clarity in offers. Perry is a big believer in checklists and includes several here, including checklists for opening, closing and re-stocking. He offers a rationale for hours of operation, scheduling, compensation and service. His emphasis on improving the service department, and the lives of technicians, includes procedures, service writing and compensation. He spends a number of pages on social marketing, as well as a calendar for planning store operations. 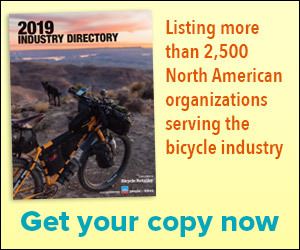 With this book, Perry joins an esteemed list of authors who have published books focused on bicycle retailing over the years, including Randy Kirk, Bannister Allen and Ed Benjamin. While some of the specific advice may be open to debate, the book challenges assumptions and is full of ideas to help bicycle retailers take positive steps now to position themselves well for the coming retail revolution.